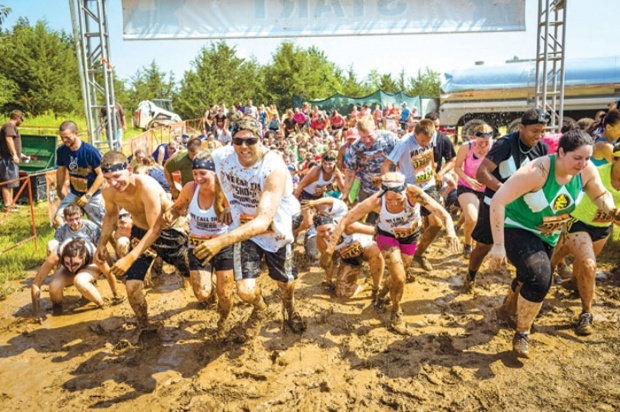 A crawl through the mud could raise money to help people with multiple sclerosis (MS) and their families. MuckFest MS, a five kilometer race and obstacle course, is designed to be accessible for young and old to participate while raising money for the National Multiple Sclerosis Society. The Twin Cities MuckFest is taking place Sept. 19 at the Somerset Amphitheater in Somerset, Wis.
“You don’t have to have outstanding athletic ability to participate, you just have to be ready to have fun in the mud,” Wilson said. Wilson expects the event will attract 2,000 participants and raise $250,000. While the muddy obstacle course is fun to run through, Wilson said there are also serious reasons for groups to come together. Last year, one couple celebrated their 25th wedding anniversary at MuckFest. Participants need only bring athletic shoes and clothes they don’t mind getting dirty, Wilson said. There is no fee for spectators to watch, and there will be food and drinks to purchase. The MuckFest MS Twin Cities 5K Mud Obstacle Run begins at 9 a.m. Sept. 19 at the Somerset Amphitheater, 715 Spring St., Somerset, Wis. Registration is $80 until Sept. 2, and then $105 until race day. For more information, visit muckfestms.com.